Melanoma is a tumor that can develop in the skin, toenail bed, lips, eye, intestine and other unusual places. These tumors originate from the pigment-producing cells called melanocytes, which are responsible for giving humans a tan with sun exposure. Melanomas located on the haired skin (except the toenail bed) generally do not spread to other organs (metastasis). Of all digital tumors, 17.3% have been reported to be melanomas. These tumors have a very high metastasis rate. 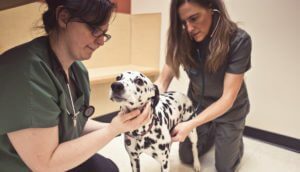 At the time of diagnosis of a digital melanoma, roughly one-third of dogs will have detectable spread of the tumor to the lungs. Melanoma is the most common oral tumor. In general, these tumors are locally invasive and spread rapidly to the regional lymph nodes and lungs. There are certain types of melanomas on the lips and oral cavity that have less tendency to spread and a good chance to be cured with surgery. A brown or black mass (lump) is the most common sign of a melanoma; however, some are not pigmented and may appear as a pink mass. A melanoma that involves the toenail bed may cause the toe to swell and cause lameness. Initially, this tumor of the digit may mimic the appearance of an infected toe; however, treatment with antibiotics does not resolve the problem. A melanoma in the oral cavity may produce signs of drooling, bad breath, reluctance to chew hard food and blood coming from the mouth. Enlargement of lymph nodes in the area of the tumor may be a sign of spread of the tumor to these nodes. If the tumor has spread to the lungs, potential clinical signs may include breathing difficulty, coughing, weight loss, poor appetite and malaise. The diagnosis of a melanoma is based upon a fine needle biopsy or surgically collecting a piece of tissue from the mass. If the fine needle biopsy does not provide a definitive diagnosis, a core of tissue may be required. 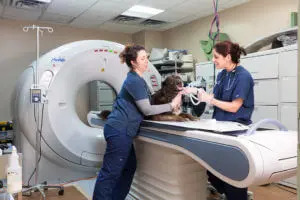 A complete blood count, chemistry profile and urine testing are done to evaluate the health of your companion’s internal organs prior to anesthesia and surgery. Chest x-rays and abdominal ultrasound are used to identify visible metastasis. (Please note that microscopic spread of tumor to other organs cannot be detected with x-rays or ultrasound.) Lymph nodes in the area of the tumor are evaluated with a fine needle biopsy to rule out spread of the cancer. If this evaluation of the lymph node is not definitive, removal and microscopic analysis of a regional lymph node is recommended. Surgery is the treatment for a melanoma. Melanomas located in the haired skin (except for the nail bed) are typically benign and only require conservative simple surgical removal. If the tumor is located on the toenail bed, amputation of the entire toe is essential. Tumors located in the oral cavity require an aggressive surgery to remove all local disease. Commonly, these tumors invade the bone; therefore, a portion of the jawbone must be removed with the tumor to achieve local control of the disease. In certain cases, an oncologist may recommend chemotherapy for melanomas. Typically, one treatment is performed every 3 weeks for a total of four to six treatments. Most patients tolerate the chemotherapy medication with transient mild side effects. Radiation therapy has been shown to prevent or delay the onset of tumor regrowth. 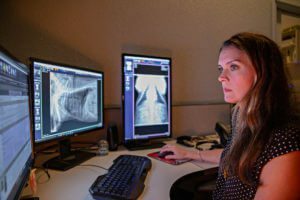 Six to seven radiation treatments are administered to the tumor site and regional lymph nodes, starting 2 weeks after the tumor has been removed. Radiation treatments are administered twice weekly. A short-duration anesthesia is required to administer each radiation treatment. A melanoma vaccine, which requires administration of a series of injections, can help the body kill residual tumor cells. Best results are achieved when all visible tumor has been removed. Skin melanomas: Melanomas that are located in the skin (except for the nail bed) carry an excellent prognosis with simple surgical removal or digit amputation, as they have a very low spread rate. Digital melanomas: Digital melanomas treated with surgical amputation of the digit resulted in a median survival time of 365 days. Digital melanomas that are not located on the nail bed and have benign characteristics (low mitotic index) can be potentially cured with surgery alone. Oral melanomas: The size of a melanoma and stage of the disease (presence of metastasis) directly affects the survival time. Patients with stage 1 tumors (less than a 2 cm diameter mass and no metastatic disease) that are surgically removed have medial survival times of 17 to 18 months. Patients with stage II tumors (2 cm but less than 4 cm in diameter mass with no metastasis) that are surgically removed have median survival times of 5 to 6 months. Patients with stage III tumors (4 cm and larger mass with spread to regional lymph nodes) have median survival times of 3 months. Stage IV tumors are those that have already spread to distant sites such as the lungs, and survival times are weeks to a few months. Negative prognostic factors include advanced stage of the disease, evidence of metastasis, and the mitotic index on the biopsy report. Death of the patient is usually due to metastatic disease (spread of tumor) typically to the lungs. Vaccination with the melanoma vaccine reportedly gives excellent long-term control of the disease and survival times with minimal to no side effects. The best result was seen with the intradermal vaccination administered with a special injector system.